Add a backup goalie to the list of offseason needs for the Boston Bruins. Confirmed w/Niklas Svedberg's agent Allain Roy he signed 1-yr deal w/Salavat in KHL: "Ultimate goal is to come back to the NHL as a starter"
Niklas Svedberg is taking his talents to the Kontinental Hockey League after signing a one-year deal with Russian club Salavat. The Swedish netminder appeared in 18 games last season for the Bruins going 7-5-1 with a goals-against-average of 2.33 and .918 save percentage with two shutouts. He was not called upon often due to Boston’s season-long battle for the playoffs but was a serviceable backup when relieving Tuukka Rask. Svedberg’s departure adds another wrinkle to Boston’s free agent plans this summer. A backup goalie is at or near the bottom of the Bruins offseason “to-do” list given their more pressing needs of re-signing Dougie Hamilton and acquiring a scoring winger via free agency or trade. Rask was called upon 70 times this season and showed signs of fatigue down the stretch. Boston cannot ignore the cold hard fact they will need a more consistent backup to give their franchise goaltender the rest he needs. The Bruins may not have to look very far to find Svedberg’s successor. Providence is home to one of the American Hockey League’s best netminders this season. Five-year AHL veteran Jeremy Smith was a stud for Boston’s farm team this season going 22-11-5 with a goals-against-average of 2.05 (fourth in the AHL) and .933 save percentage (third). The 26-year-old signed a one-year, two-way contract last summer and played better than highly touted prospect Malcolm Subban at times for coach Bruce Cassidy. The one big concern regarding Smith is his lack of NHL experience. He is a career minor-leaguer who has 200 games of AHL experience but has not tasted the big leagues in his pro career. Smith is a worthy candidate to take the role given Boston’s cap situation and pressing needs at other positions. The Michigan native is a restricted free agent but would likely re-sign with the club knowing he could earn himself an NHL job. He was only on the books for $550,000 this season and is an affordable in-house option. 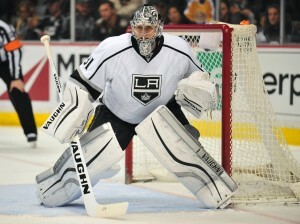 If the Bruins choose to go outside the organization, they may look to LA Kings backup Martin Jones. 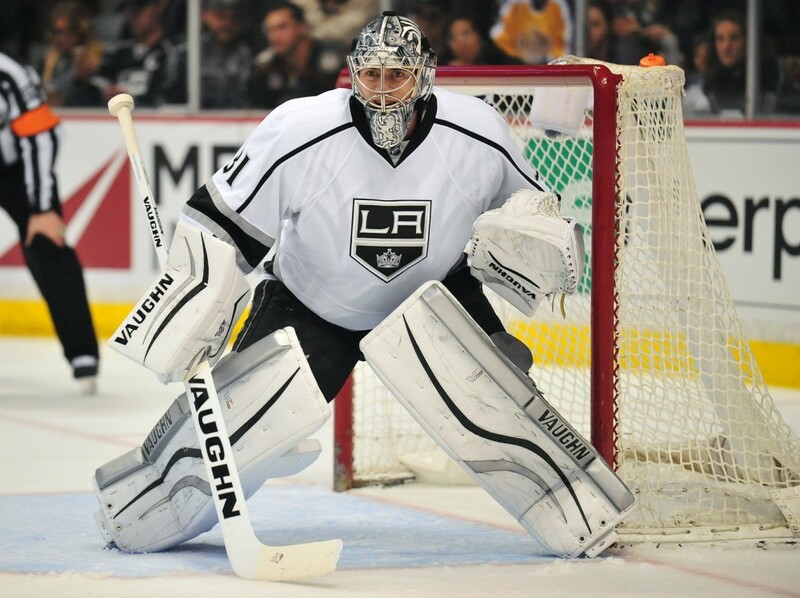 The 25-year-old goaltender has spent the last two seasons backing up former UMass standout Johnathan Quick in the City of Angels. He has performed well in his brief NHL career going 16-11-2 with a sub-two goals-against, .923 save percentage, and seven shutouts. Jones is a big body at six-foot-four-inches tall and takes away much of the net with his frame. He has averaged 17 games played in his two seasons with the Kings, showing he can be more than capable of holding his own when called upon. Jones made $550,000 last season and will be looking for a pay raise this summer as a restricted free agent. If the price is right, the Bruins should at the very least inquire about his availability. Turning to the unrestricted free agent pool now, Thomas Greiss is a journeyman backup that has been more than serviceable on his NHL travels. The 29-year-old spent this year with the Pittsburgh Penguins, his third different team in as many seasons. He made 20 appearances backing up Marc-Andre Fleury going 9-6-3 with a 2.59 goals-against and save percentage at .908, slightly below his career averages. Regardless, Greiss has been a consistent performer in his six-year NHL career. The German netminder has averaged 19 starts in the last two seasons, taking on a more expanded role with first the Arizona Coyotes before moving on to Pittsburgh. Boston is in need of someone who can be trusted to perform well enough to keep them in games without having to be replaced. Greiss has shown he is capable of doing so. He made $1 million last season and would most likely ask for a similar contract if he were to sign with the Bruins. Other potential names to keep an eye on are Jonas Gustavsson (Detroit), Peter Budaj (Winnipeg), and Curtis McElhinney (Columbus). Why not Malcolm Subban you ask? He is not ready. Boston’s first-round pick in 2012 has been merely average in his first two seasons with Providence going 29-23-4. The one game he started this season for the Bruins against the St. Louis Blues was an unmitigated disaster allowing three goals on just six shots, eventually being pulled in the second period. The first goal he allowed to defenseman Petteri Lindbohm showed that his glove hand still needs some work. Subban made a mess of what should have been a routine save. At 21, he is a raw talent but still needs at least another year of seasoning in the minors before he is ready to compete at the NHL level. It may not be a priority, but Boston’s backup goalie situation is one that bears watching for Bruins fans in the offseason.